On the run from a pack of walkers, Beth and Daryl feel like they are now constantly in danger and on the move. Remembering a time she felt safe, Beth’s fate seems like a stark contrast to the life she thought she once had achieved. Finally setting up a camp, Beth wonders if they should go searching for the rest of the group. 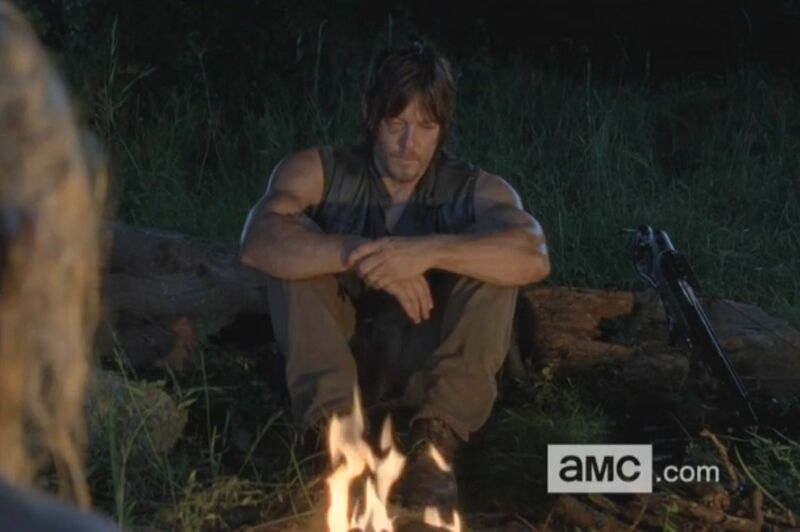 Seemingly like he has lost his hope, Daryl lets Beth’s cries for action wash over him. While she asks for him to show a little faith, Daryl strikes back about how faith failed Hershel in the end. but immediately realizes the gravity of his words. Moving forward, a rouge walker gets the jump on Beth but they are able to fight him off. Hope continues to dwindle as they only find several walkers devouring people’s remains. This leaves Beth saddened by the sight. She continues to recollect her faith and confidence as her and Daryl set up camp for the night. Lizzie, Mika, Tyreese, and Judith seem to be in the same tough spot as Daryl and Beth, but a crying baby makes their situation a little more challenging while trying to avoid the walkers. Resigned to needing to protect the children and a fussy child, they hear a rustling in the bushes. When birds pop out, Mika gets startled and runs. Catching up to her, Tyreese tries to console Mika about her fears. Tyreese leaves the girls to fend for themselves as he goes running toward the sound of screaming. Tyreese finds the same crowd of people fighting off the walkers. While he fights the walkers, Lizzie and Mika get surprised by walkers as well. Carol shows up to save the girls and meets back with Tyreese. Before dying from his walker bites, the only still-breathing member of the other group tells them to head up the tracks to a safe place. Carol explained that she saw the end of the prison and tried to follow behind Tyreese running into the woods. They find a map with a message to survivors, welcoming anyone who can make it to Terminus. Sharpening her knife against a rock, Maggie finds herself with Sasha and Bob near the river. Sasha fixes up Bob’s shoulder while he tries to convince her that Tyreese and the others could have made it out. Maggie insists that she must leave and find Glenn, saying that she knows where the bus went. While Sasha is resistant, Bob quickly agrees to follow. After walking a while, they find a bus but it is full of walkers. Needing to know if Glenn is in there, they open the back door to let each walker out one by one. Maggie stabs each one in the head but then they just spill out when too many crowd the back. Maggie phases out for a moment and snaps right back into action. After killing them all, Maggie jumps on the bus to investigate the remains. With the seats covered in blood and gore, only one walker remains. She kills it and begins to both laugh and cry at the site of it. Glenn, still stuck at the prison, is now completely surrounded by walkers. Having failed to leave, he awakens to find himself trapped next to the bridge the Governor blew up with the tank. Returning inside the dark prison, he slowly makes his way with his gun at the ready position. Finding his old cell, he pulls the tactical gear out from under the bed and takes a moment to let the pressure overtake him. Seeing the photo of Maggie next to the bed, he begins to plead for her safety. After grabbing a few more supplies, he puts on the tactical gears and tries to run his way through the walker crowd. He makes it through but is startled by Tara for just a moment. 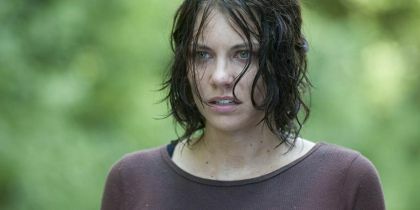 Seemingly out of touch with her situation, Glenn enlists her to help get free of the prison. They make it to the road but Tara continues to apologize for the attack. She says that she saw her sister dead in the field and saw the Governor kill Hershel. Glenn insists that they must press forward, as he refuses to give up searching for Maggie. Walkers appear and it takes all of the strength out of Glenn, leaving Tara to finish off the remaining ones. Just as she raises her head, an army truck appears and out comes Abraham Ford, Rosita Espinosa, and Eugene Porter. Reaction: Judith and Carol live! The mystery of both of them has finally been answered, somewhat. It is now clear that Judith was saved by Tyreese before Rick and Carl found the carrier, but there is no exact answer to Carol’s story yet. The only thing we know is that she saw the end of the destruction of the prison and track Tyreese and the girls. This is certainly good news for Lizzie and Mika since they get their mother figure back. This episode ended up being almost solely about the act of surviving. As a community in the prison, they had gotten to a place where they felt relatively safe. The walkers were on the outside of the gates and they suffered only small incidents with the buildup at the fences. Outside of the prison, they are now all susceptible to a random attack. Making the situation even more challenging, the pairings make the feeling of hope harder to swallow. Only Rick and Carl have each other at the moment. Beth and Maggie are separated. Tyreese and Sasha are separated. Maggie and Glenn are separated. None of the groups of survivors were able to handle being out of their protection without succumbing to a zombie attack and be required to prove themselves yet again. With so many characters reintroduced compared to last week, there is a lot to process. Daryl clearly seemed to be lost and Beth appeared to be the only character who could effectively set him straight. With the right combination of determination and weakness to survive alone, she snapped him out of his funk enough to get back on the trail. The interesting low point followed Daryl’s comment about faith failing Hershel in the end. There was a look in his eyes at that point that clearly highlighted his realization that he was losing his edge and needed to catch himself before it was too late. Finding another survivor could really bring Daryl back from the brink. Lizzie and Mika are an interesting yin and yang, making Tyreese’s life much more difficult. While he is holding himself together, Lizzie seemed to continue her readiness to fly off the handle and Mika is ready to run off. Tyreese being left to balance the kids was probably the best and worst situation for the group to be spilt as it is. Tyreese is an intense fighter but lacks the people skills to connect with kids. He somewhat made up for his weakness in a moment with Mika but then immediately left to go help the people screaming nearby. Carol’s return in that scene marked a welcomed return for Melissa McBride. Tyreese was still completely unaware of Carol’s involvement in the killing of his girlfriend but that challenge is for another episode. While there is a chance he will lose it again, he may have just enough distance from everything and too much other chaos around him to lash back out against Rick and Carol for their knowledge of Carol’s actions. It might also just be me but it seemed like Lizzie was doing more than just trying to keep Judith quiet with the way she was holding her hand over Judith’s mouth. Bob and Sasha were essentially holding themselves together, but Maggie was losing herself in the search for Glenn. Completely overtaken by the need to find him, she was willing to either run off to track him or put the others at risk to find him. Finding the bus was a pivotal moment because she had no clue if he was still on it or had gotten away. In reality, he left the bus before it ever even drove off. Killing the walkers flooding out of the bus seemed to be a release of anger for her but she also was startled by the flood initially. When she made it to the final walker on the bus, it was set up to feel like she found Glenn, though there was little chance of that being the case. Maggie is only moments from completely cracking up, so she hopefully will discover him or other survivors soon to snap her back to reality. 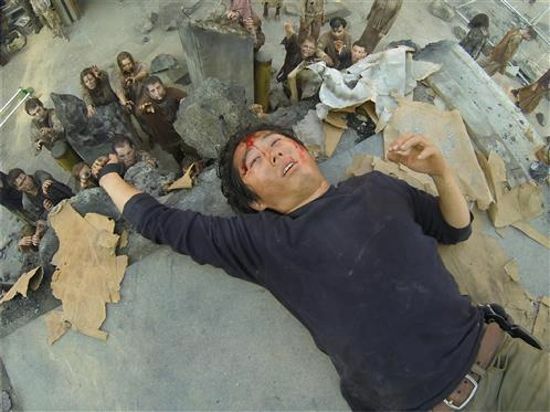 Glenn was the only survivor to be left alone at the end of the attack (minus Tara, of course). He had a moment in the jail cell where he seemed to be overcome by his fate but the picture of Maggie snapped him back to action. It was unclear if his only plan was to use the riot gear to avoid getting bitten. He just barreled through and ended up stopping when he saw Tara. Encouraged to try and find Maggie, Glenn rediscovered his purpose while Tara struggled to get ahold of hers. She felt betrayed by the Governor and distraught after seeing the dead bodies of her loved ones after the attack. Releasing a bit of her own aggression near the end, she served as the connecting point for the introduction of new characters. In the end, Daryl is distraught, tension is starting to build for an explosion between Carol and Tyreese, Lizzie appears homicidal, Maggie is on the brink, Glenn seems to still be weak, and new characters have broadened the excitement between the show and the comics.